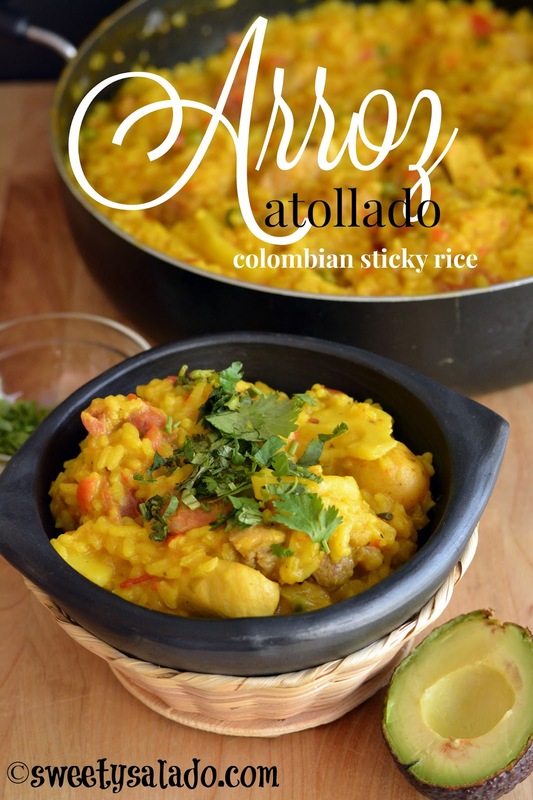 I had never heard of arroz atollado (which like many other Colombian recipes doesn’t have a direct translation, so the closest would be something like “Colombian sticky rice” or “Colombian risotto”) until I saw it for the first time years ago in one of the Colombian cookbooks that I have at home. It grabbed my attention because it’s very unique since the texture is different from say, the regular chicken and rice dish that we make in Colombia. On top of that, it also comes with potatoes, chicken, pork, and even Colombian sausage. As soon as I saw it I decided to make it, but I couldn’t get the “sticky” texture the first time I made it, mainly because I used a long grain rice and also because I didn’t add enough liquid. 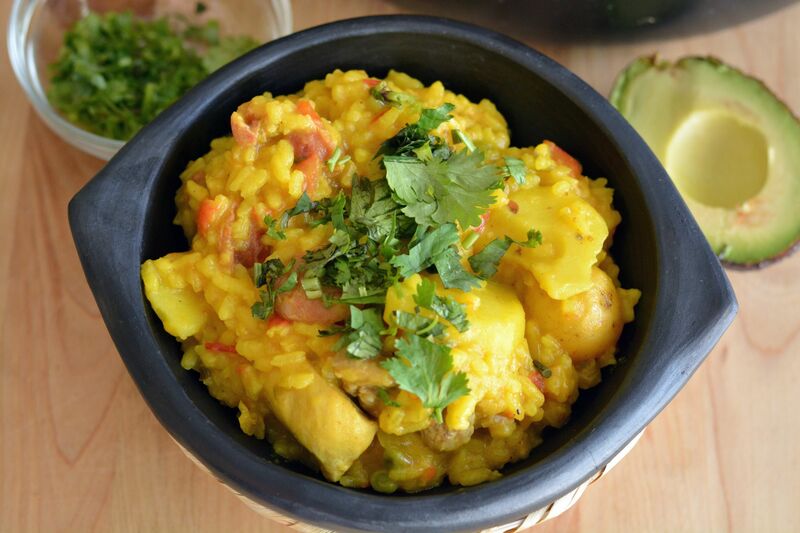 The second time I made it, I decided to use arborio rice, which is an Italian, short grain rice that is usually used for making risotto and gives you a perfect creamy texture. I also added more liquid and the end result was amazing. And since I also made the hogao (tomato sauce) the way I usually make it with onion, garlic, tomatoes, food coloring and cumin, the rice had a delicious Colombian tamal flavor. And no joke, I’m not lying when I say that it really came out incredible. And like I have told you before, finding Colombian yellow or creole potatoes, or at least of good quality, is very difficult here in the US. So, I have to use frozen creole potatoes, and not because I like them, because they come pre-cooked and extremely small, but, beggars can’t be choosers. If you can’t find them, you can use any other type of yellow potato you can find. Oh! And this dish can also be served with fried green plantain chips and slices of boiled egg. I choose not to do it because that just means extra work for me, but you can if that’s something you want to do. Heat 3 tbsp of olive oil in a medium pan on medium heat. Add the chopped white onion and cook for about 5 minutes or until it's translucent. Add the chopped green onion and the garlic and cook for another 2 minutes. Now, add the chopped tomatoes and cook for about 8 minutes or until the tomatoes are fully cooked. Season with the food coloring, cumin, salt and pepper. If you notice that the hogao is a bit dry, you can add a little bit of water. Remove from the heat and set it aside. In a large, deep pan or large pot, heat 3 tbsp of olive oil. Add the Colombian sausage and cook until it's golden brown. Remove it from the pan and set it aside leaving the fat drippings in the pan. Halfway through the cooking process, check for seasoning and add salt to taste. Also, add the Colombian chorizo. If you notice that the rice doesn't have enough liquid, you can add more water. I usually add about 2 more cups (480 ml) of water. Cover once again until the rice is ready. The texture shouldn't be too wet or too dry, it has to have a texture similar to oatmeal. 5. Serve immediately. You can also serve it with chopped cilantro, avocado, fried green plantain chips and slices of boiled egg. You can also add cooked pork ribs, about ½ pound.